This year’s Sabri Ülker Science Award has been awarded to Asst. Prof. Dr. Ömer Yılmaz, lecturer at the Cancer Research Institute of the Massachusetts Institute of Technology (MIT) for his project “Dietary control of stem cells in physiology and disease”. Award was presented with a ceremony that was held at the “II. Metabolism and Life Symposium” that took place at Harvard University Memorial Hall. 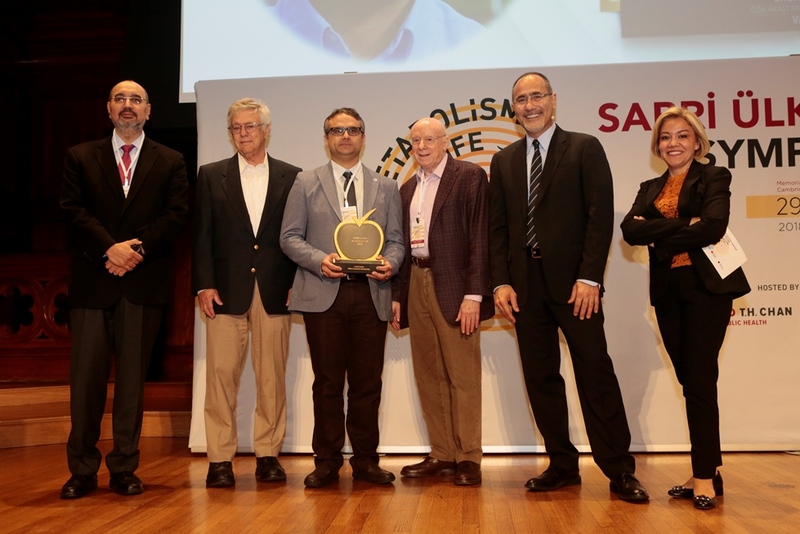 Ali Ülker, Vice President of Yıldız Holding, Prof. Michael Brown and Prof. Joseph Goldstein, Nobel Prize winners in Medicine, and Prof. Gökhan Hotamışlıgil, President of the Sabri Ülker Metabolic Research Center have presented award to the winner. The project on which Asst. Prof. Dr. Ömer Yılmaz has been working for five years in order to find out how nutritional routines causing obesity affects intestinal stem cells and also how obesity triggers intestinal cancer revealed that a high-fat nutrition habits cause the stem cells to mutate and multiply and thus cancer increases. Yılmaz’s research titled “Dietary control of stem cells in physiology and disease” was also published in Nature journal which is one of the most prestigious science journals in the world. Asst. Prof. Dr. Ömer Yılmaz, the winner of the Sabri Ülker Science Award, studied his dual program MD and Ph.D educations at Michigan University with a full scholarship. The Ph.D project of Asst. Prof. Dr. Ömer Yılmaz who was granted the Harold M. Weintraub Award in 2007, the best international PhD study award in the science of biology, was published in Cell, Nature, Blood, and Cancer Cell magazine which is among the most notable science journals in the world. Yılmaz completed his post-graduate studies in 2011 in the field of pathology in Massachusetts General Hospital, the main hospital of Harvard Faculty of Medicine, and he has been a lecturer at Massachusetts Institute of Technology (MIT) Koch Institute since 2014. Asst. Prof. Dr. Ömer Yılmaz continues his cancer research at the laboratory which he founded at the same university on his own behalf was granted the awards of Sidney Kimmel Foundation, V Foundation and Pew Foundations, R01/NIH funding as well as AAAS Martin and Rose Wachtel Cancer Research for his researches on the issues of how intestinal stem cells in adult humans are affected by environmental factors such as nutrition and foods and how they are exposed to diseases.